that lived there in the 12th century, 33 generations ago. Really well taken- great mood to it. It would be so cool to be given a private tour of the castle...VT! Love the light fog and it looks so well in bw! A superb photo in B&W of this fairy tale castle. We've visited this castle on 2 different trips. Such a pretty place! Magnificent, Tom. Stunning photography. Vote. This is a stunning and beautiful image. I wish you a great New Year ! I wonder whether or not some of the occupants, have ever looked into every room of this sinister, yet beautiful castle. Rising magically from the mists. I can't imagine anyone living there with such small windows. the mood was so lovely to go with the magical castle.V. A fairy-tale castle photographed in fine fairy-tale atmosphere. Wonderful. Without a doubt one of the most beautiful castles in Germany due to its complexity, condition and location. A great shot of it in B&W Tom. 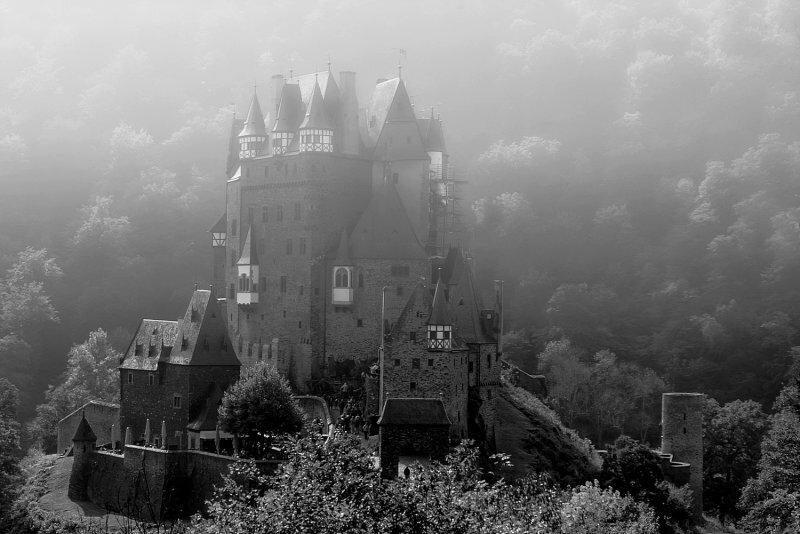 "V"
Super B&W image of this castle shrouded in light fog. Such a wonderful atmosphere and a magnificent structure. Excellent photography and processing, Tom. Fantastic image of it through the lifting fog. Love this in B&W, Tom. Viewing this is like traveling back in time, an elusion made more profound by the wonderfully foggy setting. A fairyland castle shrouded in mist and touch by sun. a marvel of construction and so well shown here. "VVV"
excellent picture, that b&w fit perfectly! Wow, you really nailed this one, Tom! Beautiful work..
Looks like a fairy tale scene in that light fog. Beautiful capture, Tom. V.